UB40 Featuring Ali Campbell, Astro & Mickey Virtue reunites the main creative bodies behind Britain’s biggest reggae band, responsible for such hits as Red Red Wine and Can't Help Falling In Love and have sold over 70 million records across the globe. Perhaps the ultimate summer band, they have just announced a headline date at Holkham Hall in Norfolk on Sunday 27th of August where they will perform their classic hit plus play new songs. Take a look at our Interview With Astro, talking about their upcoming gigs and career. 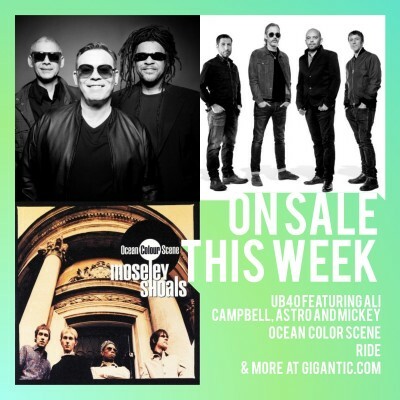 Tickets UB40 Featuring Ali Campbell, Astro & Mickey Virtue for the new show go on sale 09:00 on Friday. Festival organisers of Live In The Wyldes have finally announced that the main act for Saturday night will be Chase And Status performing a massive drum and bass DJ set. They join fellow headliners Rag ‘N’ Bone Man and The Human League for a phenomenal weekend. The action all takes place at the custom-made site set in a scenic valley in North Cornwall, only a stone throw away from the idyllic British beaches for which the region is famed. Live In The Wyldes tickets are currently on sale. Hard rockers Thunder have been instrumental in pushing metal forward. Having first started in 1989, their career has endured numerous breakups only to re-emerge better than ever and continue to play to massive crowds, proving the enduring power of their music. Having already sold out the first night, Thunder have announced a second night of their Xmas Show at Wolverhampton Civic Hall due to popular demand to take place on Saturday 16th of December. Thunder tickets are currently on sale. Migos & Lil' Yachty are two of the biggest names in hip hop and together will take over the world. Three-piece group Migos burst onto the scene in 2014 and Lil' Yachty is famed for such hits as One Night and Minnesota. The pair unite for an incredible show taking place at O2 Academy Brixton on Wednesday 26th of April. Tickets are expected to sell very fast so make sure you book yours before they are all gone. Migos & Lil' Yachty tickets are currently on sale. Ocean Colour Scene exploded in the 90’s and became a central pillar of Britpop with the release of seminal second album Moseley Shoals. The mod revivalists have since enjoyed a career which has seen the release of a staggering seventeen Top 40 singles. Join them when they take over the new Hull venue Zebedee’s Yard on Friday 11th of August. Tickets released at 11:00 on Friday. Seminal shoegaze band Ride made their welcome return in 2014 enabling a new generation unite with old fans to enjoy their enormous live sound. With the impending release of new album Weather Diaries, they announce an unmissable gig at New Theatre in Oxford on Monday 10th of July which goes on sale 10:00 on Friday. Every year, Handmade offers their attendees great headliners combined with cutting edge acts. This year they host Twin Atlantic, Frightened Rabbit and many more! The Bath Festival offers ten days of various world class acts and cultural events. The city delights in welcoming the greatest talent in music and literature. The Bath Festival tickets are currently available. Look back to the decade of decadence and enjoy such ubiquitous acts as Jason Donovan, Nik Kershaw and Bucks Fizz when Jack Up The 80s come to the Isle Of Wight. Jack Up The 80s tickets are currently available. Taking place at The Big Park in Buckinghamshire, Penn Festival presents such huge names as Primal Scream, The Charlatans, Sigma and James. Having released second album Long Live The Angels just last year, soul singer Emeli Sande now prepares to embark on an unmissable tour in October where she will play her new material plus songs from her stunning debut Our Version Of Events. Grammy Award winning R&B songwriter John Legend has announced an extensive September tour which takes him all over the UK. Do not miss your chance to see the world-famous New York star perform live at a stage near you.